This mid-September edition of Modern Restaurant Management (MRM) magazine’s popular “According to ..” restaurant and hospitality research roundup features a survey of how chefs perceive food safety, what Canadian diners expect from technology and The Forecast for the Future of Korean Food & Beverages in the U.S. The Good Food Media Network released a new study detailing the economic contribution of good food purchases. Conducted by the Business Research Division (BRD) of the Leeds School of Business at the University of Colorado Boulder, the Good Food Media Network report found that the overall food purchases by the 90 participating Good Food 100 Restaurants totaled $94.8 million in 2016, of which $68.1 million were derived from good food purchases. “The study findings show that there are restaurants making intentional efforts to know their supply chain and purchase a higher standard of food,” said Brian Lewandowski, Associate Director, BRD. The 90 participating restaurants reported 72 percent of national food purchases were good food purchases. The percentage was greatest for participating Fast Casual restaurants (93 percent) and Fine Dining restaurants (83 percent). Nationally, restaurants reported the greatest percentage of good food purchases in the Fish and Seafood (84 percent) and the Meat and Poultry (83 percent) segments. Compared to total national purchases, a greater percentage of regional purchases were good food purchases (89 percent), with Fast Casual (96 percent) and Fine Dining (91 percent) leading. Regionally, restaurants reported the greatest percentage of good food purchases in the Fish and Seafood (99 percent) and the Meat and Poultry (95 percent) segments. Regions that reported the highest percentage of good food purchases included the Far West region (90 percent) and the Mideast region (89 percent). Good food purchases within region were highest for the Mideast region (100 percent), Great Lakes region (99 percent), and the combined Southwest and Plains region (99 percent). 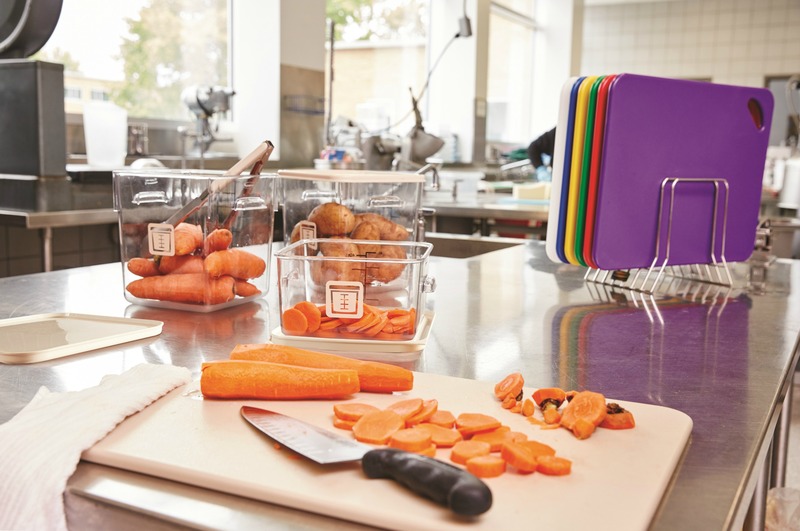 Nearly every restaurant reported efforts to reduce food prep waste in the kitchen (99 percent), using eco-friendly paper products and carryout containers (97 percent), and recycling (94 percent). Two-thirds to three-quarters of restaurants reported composting, eco-friendly cleaning supplies, workforce benefits, and reducing post-kitchen food waste. Findings from Technomic Inc.’s2017 Away-From-Home Beverage Study indicate that nonalcohol beverages are a large and growing part of the foodservice industry. From staples like soft drinks, teas, coffees and juices to emerging categories like cold-brew coffee, energy drinks and enhanced waters, hot and cold beverages accounted for over $181 billion in annual sales and totaled over 113 billion servings in 2016. Although soda and regular coffee continue to drive beverage volume overall, formats like specialty coffee (hot and iced), bottled water and energy drinks are expected to continue their already rapid growth in the next three to five years. While key attributes like taste and refreshment still dominate the consumer mindset, there is an increased emphasis on beverage health and functionality due to demographic (i.e., generational, ethic) and regulatory (e.g., regional soda taxes, mandatory calorie labeling) shifts. No longer are consumers simply looking for a convenient meal compliment; rather, they are coming to foodservice operations seeking fulfillment of diverse beverage occasions like snacks, pick-me-ups or meal replacements. As such, manufacturers and operators need to come prepared with multifunctional items that can serve a variety of dayparts. Diet beverages sweetened with zero-calorie sugar substitutes (e.g., aspartame) are no longer perceived to be healthy. Other, more natural sweeteners such as agave, Stevia and honey are among the better-for-you sweeteners capturing increased consumer and operator attention. While brand-name beverages are still critical to consumers—over 50 percent consider brand name either somewhat or very important—younger generations tend to downplay brand importance relative to older generations. Pricing and taste remain the top two attributes operators emphasize when sourcing their beverage products. Insights were collected from more than 800 foodservice operators and more than 3,000 consumers through comprehensive surveys, in-depth interviews and interactive discussion boards, with supplemental findings from Technomic’s exclusive Digital Resource Library and MenuMonitor tools. September is National Food Safety Month, and this year’s theme focuses on The Culture of Food Safety–specifically how food safety is now synonymous with an owner’s reputation. 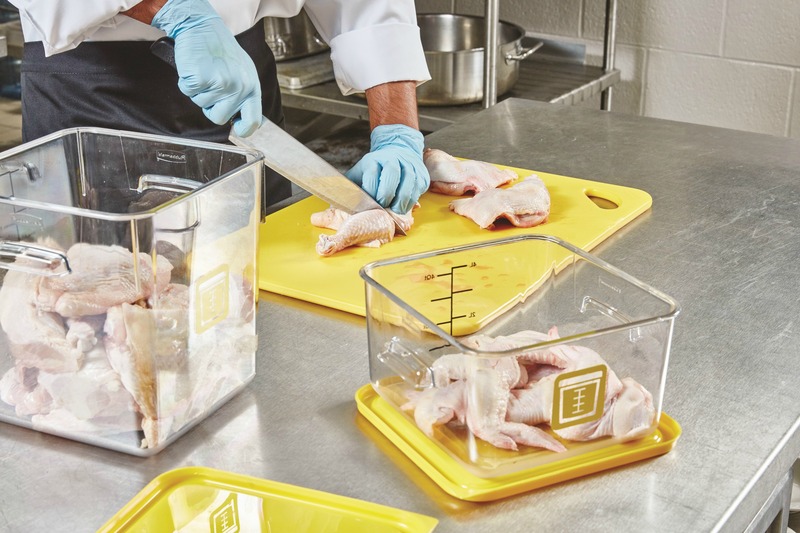 Rubbermaid Commercial Products (RCP) recently partnered with the American Culinary Federation (ACF) to conduct a survey with over 750 chefs to understand their behaviors and attitudes towards food safety, and have uncovered some interesting findings regarding pain points for chefs. According to the survey, word of mouth about food contamination, specifically the impact on a chef’s reputation (63 percent) and social media and viral effects (57 percent), are primary concerns for chefs today. And while food safety awareness is greater than ever, there are still challenges with implementing cross contamination procedures. With customers becoming more demanding than ever and close to two-thirds of chefs reporting that they are concerned about receiving a bad reputation from cross contamination, RCP recently unveiled their new color-coded foodservice system designed to provide chefs with an easy to use solution to help reduce foodborne illness and cross contamination. OpenTable released the results of its latest Technology and Dining Out research survey*, which explores Canadian diner sentiment toward the use of technology before, during and after the dining experience. Best seat in the house: Fifty-six percent of diners want restaurants to know their preferred table or seating area. Seventy-six percent of diners believe choosing a table or seating area would improve their experience. It’s about the little things: Diners also want restaurants to know special dates, such as birthdays or anniversaries (44 percent), number of times visited (33 percent) and dietary preferences (29 percent). Skip the line: Seventy-two percent of diners would like the option to add themselves to the waitlist before they arrive. Cool or Creepy: Fifty-three percent of diners think it’s a good idea or are not bothered by the idea of restaurants Google searching them prior to their arrival. Focus on the food: Forty-six percent of diners say they hate it when people they’re dining with use tech during a meal because it disrupts their experience. Oh snap! Eight percent of diners take photos during their meals to remember the experience. A human touch: Sixty-five percent of diners agree that automation, including robots taking orders and preparing food, takes away from the experience of dining out. Technically solo: When eating alone, diners want their tech to keep them company. Twenty-two percent use their phones several or multiple times while eating solo at a fine-dining restaurant (33 percent for those under 34) compared to 47 percent of diners (and 71 percent for those 34 and under) dining solo at a counter service restaurant. Tech to try: Diners want to experiment with technology they’ve never used before, with 50 percent open to mobile payments so they don’t have to wait around for the cheque, or even a button on the dining table to alert staff to an issue (37 percent). Keep them coming back: Twenty percent of diners always or frequently interact with a restaurant’s loyalty program (a further 27 percent use them sometimes). Restaurant apps: Only four percent of diners are very likely to download the apps of individual restaurants they’ve visited. The Forecast for the Future of Korean Food and Beverages in the U.S.
It’s no secret that the demand for Korean food is on the upswing in the U.S. In fact, it’s the third largest market for Korean food products just after Japan and China, and has been averaging a 10 percent yearly increase for the past 10 years, according to Korea Agro-Fisheries & Food Trade Corp (aT Center), Korea’s leading organization for the globalization of Korean agricultural and fishery products. This increase is a strong indicator that Korean imports will continue to become more mainstream in the U.S. beyond the already growing exports such as kimchi, gochujang and seaweed. A wide assortment of new Korean food and beverage products that are ripe for distribution and consumption in the US were showcased September 4 and 5 at the K-FOOD FAIR New York, a two-day, business to business trade show organized by South Korean Ministry of Agriculture, Food & Rural Affairs. “Interest in Korean food is continuously increasing in the North American market and can be easily seen in Wal-Mart, COSTCO and other major retail stores. We are working and assisting exporters to improve their business, including labels and packaging guidance for better local appeal. We very are excited to introduce more new products and encourage market penetration through the 2017 K-FOOD FAIR B2B New York,” stated Jin-suk Baek, Executive Vice President for Food Industry & Export Promotion: Division of Korea Agro-Fisheries & Food Trade Corp.
U.S. consumers have become more familiar with some of these key products mentioned above thanks to former First Lady, Michelle Obama, restaurants, food trucks and television cooking shows that have been showcasing them for some time; among them, popular items such as Korean tacos, Korean fried chicken and bibimbap. The trend has even been seen trickling down to the youth market with children who are bringing rice and seaweed snacks to school and finding their friends wanting to trade them for these in-demand items. Shh, don’t tell them these snacks are also healthy for them! Chef Sechul Yang, Sous Chef of Maialino restaurant in New York City shared, “Chefs in New York always look for new ingredients and traditional techniques to be used in modern ways, such as rediscovering fermentation, aging and pickling ingredients for preservation, and using those techniques as components in modern dishes. While Korean products have done well in communities with a strong Korean or Hispanic base around the country, they are also seeing growth in other markets including Portland, Oregon, Atlanta, Georgia and Houston, Texas, with the most popular selling Korean products being those that are healthful. Pickled and fermented foods in general have been on the rise due to their health benefits, so probiotic products like kimchi have become a desirable new alternative due to their flavor and crunch. Technavio has announced the top five leading vendors in their recent global craft spirits market report. This research report also lists eight other prominent vendors that are expected to impact the market during the forecast period. Technavio’s market research analysts predict that this market will grow at a CAGR of nearly 27 percent until 2021. The demand for craft spirits is expected to increase during the forecast period due to the perception among consumers that craft spirits are better in terms of quality and taste than mainstream spirits brands. Also, the entry of new players and launch of new products by players will aid the market growth during the forecast period. Large players are acquiring small players to increase their presence in the market. “Players in the market are coming up with new products to meet the rising consumer demand. Also, players are investing in increasing their production and distribution capabilities. They are also investing in developing innovative products with unique ingredients. Players in the market are also trying to promote tourism at their production sites by organizing distillery tours and also setting up tasting rooms,” says Manjunath Jagannath, a lead alcoholic beverages research analyst from Technavio. Bacardi is the world’s largest privately held spirits company that produces and markets a wide range of spirits and wines. It has more than 200 brands and labels. Some of its major subsidiaries are Bacardi-Martini Austria, Bacardi-Martini Finland, Bacardi-Martini Germany, Bacardi-Martini Japan, Bacardi USA, Bacardi Netherlands, and Bacardi-Martini Belgium. In May 2014, Suntory Holdings acquired Beam and changed its name to Beam Suntory. Both companies became one unit, and Beam Suntory now operates as a manufacturer and retailer of distilled spirits in the global market. The company functions through various business models to sell and distribute its products in the market. Constellation Brands is investing in small and upcoming craft distilleries to help improve its presence in the market. Through its venture capital division, the company has acquired minority stakes in two companies: Crafthouse Cocktails, which is based in Chicago, US, and Nelson’s Green Brier Distillery, which is headquartered in Tennessee, US. Distell is Africa’s leading producer of wines, spirits, ciders, and other ready-to-drink beverages. The company was created in 2001 as a result of the merger between Distillers Corporation and Stellenbosch Farmers Winery Group. The company claims to be the second-largest producer of cider globally. Pernod Ricard manufactures spirits and wines. It offers vodka, rum, gin, champagne, bitter, and brandy, among others. The company is a leader in the US market. Absolut, the vodka brand of the company, launched new packaging bottles called Absolut Electric bottles on September 21, 2015. They are available in striking silver and electric blue. The global halal food market is anticipated to reach USD 2.55 trillion by 2024 driven by the rising demand for the consumption of halal meat which is healthy and made in a hygienic manner. The growing awareness of halal food and its positioning as hygienic and healthy food among both Muslim and non-Muslim community is expected to drive the demand over the forecast period. Asia Pacific has the highest market share in terms of revenue and is projected to maintain its dominance in the market over the forecast period. Increasing Muslim population and the growing awareness among consumers in Asia Pacific countries such as Pakistan, India, and Bangladesh, Indonesia, Singapore, and the Philippines are expected to drive the market over the forecast period. The absence of a uniform halal standard across countries makes it challenging for vendors to get their products halal certified. Besides, the market is fragmented in nature, which makes it further challenging for multiple vendors to operate in different countries. In the market, there is also a need for an oversight on the halal food industry considering the halal meat scandals inEurope and North America regions. Processed food & beverages dominated the market in 2016 and are expected to maintain its leading position over the forecast period as well. Food & beverages segment was followed by bakery products segments and confectionary segments. Over the forecast period, bakery products segment is expected to grow at a CAGR of 9.6 percent with an increasing demand for ready to eat and packaged bakery products such as cookies, doughnuts, savoury pastries, pretzels, biscuits and cakes. The market is fragmented with the presence of many international and domestic vendors. Vendors in the market are focusing on product quality and geographical expansion globally. Vendors are also registering themselves with halal certification organisations. Some of the leading players operating in the halal food market are Al Islami Foods, QL Foods, Saffron Road Food, Dagang Halal, Janan Meat, Kawan Foods, Cargill, Prima Agri-Products, Nestle and Cleone Foods. Over the past few years, fast food chains such as KFC and McDonalds have started providing halal certified products to widen their customer base. New research from Grundig, shows that 94 percent of consumers want to live a more sustainable life, but almost two thirds lack the time or aren’t sure how to do so. Sustainability is important to 97 percent of consumers across Europe, according to a July 2017 survey commissioned by Grundig and conducted by research firm Morar with over 3000 respondents across six European countries. Almost three quarters of consumers want to reduce their food waste, with over half admitting that they throw away fruits and vegetables most often. In addition, almost two thirds consider food waste to be a significant environmental issue, yet almost a third waste over 4kg of food per month, equivalent to six loaves of bread. In addition, 90 percent of consumers feel that they are concerned about the amount of food they waste, but that a lack of time and hectic lifestyle make changing habits difficult (56 percent of respondents). Consumers with children have an additional motive for reducing food waste: 84 percent said that it is very important to teach this to the children in their home, because they want them to live a sustainable home life (81 percent), learn to be responsible with money (63 percent) and learn to protect the environment (55 percent). “Grundig commissioned this research study in order to further explore consumers’ attitudes to food waste and sustainability. Reducing food waste and helping consumers live more sustainable lives is at the heart of Grundig’s mission, and consequently product design. Grundig’s research showed that consumers have a strong desire to become more sustainable, and many consumers are trying to do this: 82 percent are doing some form of recycling, 75 percent aim to conserve energy and 74 percent say they are trying to reduce food waste. However, there is clearly a need and a desire for consumers to do much more to reduce overall energy consumption and environmental impact, and it is clear that consumers need convenient, simple and smart ways to reduce their environmental impact and eliminate food waste. This is where Grundig is working to make a difference,” said Zeynep Özbil, Global Head of Communications, Arçelik Group, parent company of Grundig. More business-to-consumer (B2C) companies value social media compared to business-to-business (B2B) companies, according to a new survey from Clutch and Smart Insights. The findings indicate a growing consumer preference to make purchasing decisions based on their social media activity, a reality that favors B2C companies. Nearly 60 percent of the B2C companies surveyed report that social media helps increase their revenue and sales, compared to 46 percent of B2B companies. Experts say the current social media environment is ideal for consumers and the B2C businesses that have a presence there. B2C companies prefer consumer-focused social media channels, such as Facebook and YouTube, while B2B companies prefer LinkedIn and Twitter because they can easily target other businesses. B2C companies (82 percent) also tend to post more original content to social media than B2Bs (74 percent). B2B businesses typically use social media with the objective of becoming an authority in their respective industry, while B2C companies are driven to influence customers to buy something. The study also identifies the social media content that engages consumers best—articles, videos, and images—and the challenges social media marketers face, such as not having enough resources and problems with refining social media efforts into a formal strategy. Clutch’s 2017 Social Media Survey included 344 social media marketers at companies from around the world with more than 10 employees; the respondents are split evenly between B2B companies and B2C companies. Eighty-one percent of Gen Z believes they can have an impact on social and environmental issues by using social media, according to the 2017 Cone Gen Z CSR Study: How to Speak Z. The study, surveying Americans ages 13-19, examined this budding generation’s aptitude and attitudes toward company involvement in social and environmental issues – and just how they’re willing to stand up for causes they care about. The research revealed social media plays a critical role in how this always-connected generation wishes to engage with companies around corporate social responsibility (CSR) initiatives. Eighty-two percent use social media to talk about issues they care about and a majority (87 percent) are likely to share their positive opinion of companies addressing social and environmental issues. Brought up in an age of recycling programs and diversity education, Gen Zers are a highly enlightened group. Ninety-two percent say they care about social and environmental issues – and they express concern for the future. Nearly nine-in-10 (89 percent) say they’re worried about the health of our planet. To solve for this, they see companies as vital solution providers, with 94 percent believing companies should help address critical issues. Gen Z looks to its purchasing power as a key way to support responsible companies. Nearly nine-in-10 (89 percent) say they would rather buy from a company addressing social or environmental issues over one that is not, and 92 percent would switch brands to one associated with a good cause, given similar price and quality – skewing just slightly higher than the national average (89 percent). Still, this generation with a notoriously short attention span can’t be expected to seek out CSR messages. In fact, just shy of two-thirds (65 percent) said they pay attention to a company’s CSR efforts when deciding what to buy. When purchasing a product with a social or environmental benefit, Gen Z is most likely to look to those closest to them for information. Parents (54 percent) and their close group of friends (44 percent) are most likely to influence purchasing decisions. And in line with the growing importance of social media in the lives of this generation, Gen Zers are also equally swayed by people on social media (26 percent) and the news (26 percent). Companies (17 percent) and celebrities (16 percent) fall to the bottom of the list of Gen Z’s trusted sources. Gen Z sees social media as a powerful tool to create change. In fact, more than half (58 percent) feel that supporting social or environmental issues online is actually more effective at making a difference than doing something out in their communities. In alignment with this feeling of individual empowerment, the top motivation to share online content related to CSR efforts is to motivate others to care as well (38 percent). This generation is less motivated by more self-interested actions like showing others what they care about (19 percent), wanting to be a part of the conversation about the world around them (11 percent), showing others they are informed (7 percent) or making them look like a good person (3 percent). New research from Mintel reveals that over one quarter of German consumers (27 percent) agree that low/no alcohol beer tastes just as good as full-strength beer. While younger consumers may have been the most enthusiastic beer drinkers in previous generations, today, this cohort is among the most likely to see the merits of low/no alcohol beer: three in 10 Germans aged 18-24 (31 percent) agree that low/no alcohol beer tastes just as good as ‘regular’ beer (4-6 percent ABV). With many consumers enjoying the taste of non-alcoholic beer, the stigma may now be disappearing. Mintel research highlights that a mere 9 percent of German consumers say they would be embarrassed to be seen drinking low/no alcohol beer. This Oktoberfest it seems many will be opting for a low/no alcohol beer in order to forgo the hangover. Among German consumers, over half (53 percent) agree there is “less chance of getting a hangover if you drink low/no alcohol beer, rather than full strength (4-6 percent ABV).” This rises to three in five French consumers (61 percent). But it’s not just the hangover that consumers are keen to steer clear of; over half of consumers in France (56 percent) agree that low/no alcohol beer allows you to stay in control when drinking. “Control has become a key watchword for today’s younger drinkers. Unlike previous cohorts, their nights out are documented through photos, videos and posts across social media where it is likely to remain for the rest of their lives. Over-drinking is therefore something many seek to avoid,” added Forsyth. Consumption of non-alcoholic beer is growing fast, with as many as 33 percent of Spanish, 23 percent of German and 9 percent of French consumers drinking this variety. However, while European interest is high, China is the most prolific global innovator of low/no alcohol beer* product launches, according to Mintel Global New Products Database (GNPD). More than one in four (29 percent) beers launched in China in 2016 contained low/no alcohol, compared to one in 10 beers launched in Spain (12 percent), Germany (11 percent) and Poland (9 percent). Meanwhile, the global average sits at just 8 percent. Mintel research highlights that the Middle East and Africa may be a hotbed for low/no alcohol beer launch activity in the coming years. According to Mintel GNPD, almost one third (30 percent) of beer launches in the Middle East and Africa contained low/no alcohol in 2016, up from 22 percent in 2015. When it comes to future product innovation it seems the majority of Germans have full faith in tried-and-trusted brands. According to Mintel research, over half of German consumers (56 percent) say they would trust their favorite brand to produce a good tasting low/no alcohol version. “Our consumer research confirms the importance of brand trust in helping consumers to overcome the significant taste barrier. The success of non-alcoholic beer innovation in Germany offers lessons for what can work in other markets. German non-alcoholic beer producers have vastly improved production techniques, resulting in over half of German non-alcoholic beer drinkers agreeing that non-alcoholic beer tastes as good as a standard alcoholic beer,” Forsyth concluded. Technavio’s latest report on the global commercial undercounter ice machines market provides an analysis of the most important trends expected to impact the market outlook from 2017-2021. Technavio defines an emerging trend as a factor that has the potential to significantly impact the market and contribute to its growth or decline. The growth of the global commercial undercounter ice machines market will primarily be driven by various factors such as the expansion of organized retail due to increase in consumer spending at supermarkets, hypermarkets, and grocery stores. These store formats sometimes have small restaurants that serve chilled beverages along with food items; some restaurants also use ice for displaying seafood and other perishable items. Commercial undercounter ice machine manufacturers are introducing new products, which have improved durability, water efficiency, and ice productivity. For instance, Scotsman Ice Machines offers commercial undercounter ice machines, which has a sensor for detecting the quality of water. “The sensor is designed to detect hard water conditions, and the control system removes the mineral-laden water in every harvesting cycle. These machines also have insulated storage bins, which ensures the storage of ice for longer time period before it starts melting,” according to Gupta. Due to the intense competition and need for cost-savings, end-users of commercial undercounter ice machines increasingly prefer energy-efficient machines. Thus, to gain market share and comply with the standards, many commercial undercounter ice machine manufacturers are adhering to energy efficiency certifications. ENERGY STAR is one such energy certification that is popular among commercial undercounter ice machine manufacturers. Vendors are also focusing on developing new technologies to make these machines more energy-efficient. For instance, Welbilt’s commercial undercounter ice machines have a delay feature that allows the pausing of the ice production when required, which provides high energy efficiency. The ice type and size play an important role in chilling beverages. Besides this, ice is also used in juices and sodas for shaking and stirring. Ice also increases the appeal or presentation of a beverage. Owing to such benefits of ice, manufacturers of commercial undercounter ice machines are focusing on introducing new types of ice and ice storage systems to increase the efficiency and quality of ice produced along with the storage capacity. Welbilt offers commercial undercounter ice machines that contain the patented technology LuminIce Growth Inhibitor, which creates active air that passes over all the exposed components to prevent the growth of bacteria, yeast, and other common microorganisms. These units also have a delay feature that ensures that ice is produced only when required and thus, saving resources. Every year, U.S. dairy farmers produce three billion more pounds of milk than the year before. For the past few years, production growth has outpaced processing capacity growth and dairy processors are struggling to keep pace, according to a new report from CoBank’s Knowledge Exchange Division. Numerous new plants and plant expansion projects are underway or recently completed, but available capacity remains a challenge at times — especially in the Northeast and Mideast areas — and has strained the ability of dairy cooperatives to fill the role of market balancers. Since these co-ops largely bear the brunt of the near-term oversupply of milk, they are increasingly looking for ways to discourage producers from expanding production. Meanwhile, recent lower milk prices have led to lower input costs for processors, strengthening balance sheets and opening the door to expansion opportunities, said Laine. “In some cases, this may mean upgrading existing, aging facilities, while in other instances it may mean new plant projects,” he said. Many dairy cooperatives and some independent processors have focused on building and expanding milk powder processing plants. These newer, large-scale plants are better able to meet international demand and position companies for export market competitiveness. These plants have been popular in California and the Southwest. Conversely, without updates, some of the mid-size aging commodity plants, those that produce butter and nonfat dry milk, will struggle when competing against more modern powder plants, said Laine. Although U.S. consumers’ fluid milk consumption has been slowing, investments are occurring in fluid milk bottling plants to process specialty products like organic milk and extended shelf-life products or to upgrade and replace existing, aging infrastructure. Recent expansions of cheese-making plants — which have the potential to handle much more substantial amounts of milk than other processing plants — have been completed in the Southwest. And new plans for cheese plant expansions in the Upper Midwest are expected to relieve some of the region’s recent capacity constraints once they come online. Increasingly, cooperatives are setting their sights on cheese plants as opposed to commodity balancing plants, and are looking to joint ventures as a means to do so, according to the CoBank report. In addition, many international companies are looking for ways to establish a U.S. manufacturing footprint to gain access to the U.S. milk supply for what is expected to be long-term growth in global demand. U.S. milk production shows no sign of slowing, but that growth will not be sustainable unless processing capacity is able to keep pace. Similarly, the expansion of processing capacity will not be sustainable unless there is consumer demand to back it up. Finding the proper supply and demand balance as processor capacity is built will be a challenge and will likely cycle through periods of near-term surplus and shortage, according to the report. Processors will need to stay focused on the consumer, whether domestic or international, and form partnerships as needed to meet demand. “At times of surplus milk, the need for added processing capacity in any form seems critical, but for the long-term health of the industry, the focus should be on building the right type of capacity to meet growing global demand,” concludes Laine.